Figuring out where your baby will sleep is a much bigger decision than most people think. 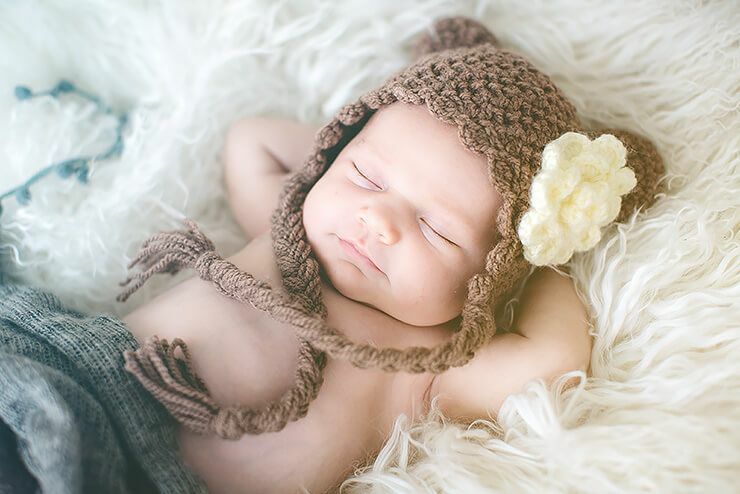 When you're sleep deprived and constantly busy caring for this new little life, getting an extra few minutes of sleep can quickly become a top priority. There are a few options for new parents. We will focus on in-bed and bedside sleeping, these terms are interchangeable with co-sleeping. Both will have their benefits and drawbacks. Choosing the right bassinet for you and your baby will depend on your lifestyle, priorities and comfort level. Some parents choose to In-Bed Sleeping with their baby. It can make breastfeeding easier because your baby is in such close proximity. Having a parent's presence all night long is also very comforting and nurturing. For many families, this translates to better sleep for everyone. Another alternative to consider is bedside sleeping. It gives families the opportunity to be close to one another while providing some space. This sleeping method reduces the risk of SIDS in babies under the age of one because parents are can keep an eye on the baby. It’s also a great option for new parents and their little ones. Whether families choose to co-sleep, safety is every parent's top priority. If your baby is going to sleep in the family bed or on their own, they'll need their own little baby-proof space with plenty of ventilation, breathable fabrics and safe materials. Here are the best bassinets for co-sleeping. This product is made specifically for co-sleeping. It goes in bed with mom and dad, but gives your baby their own space for sleeping. In my opinion, the SwaddleMe By Your Bed Sleeper is one of the best bassinets for bed sharing. 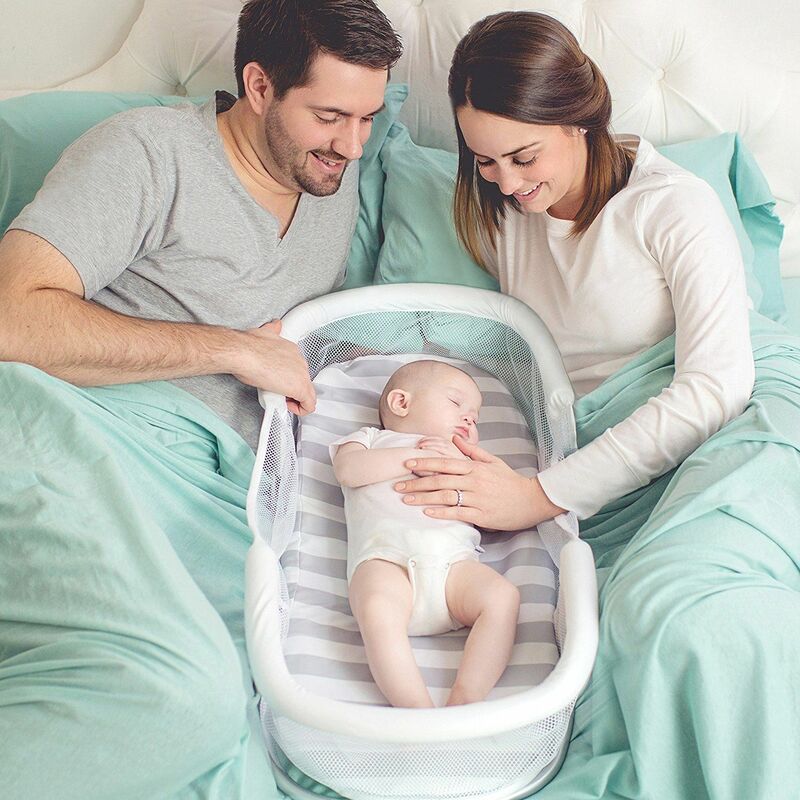 This sleeper has sides made of metal and mesh material which creates a solid barrier between parents and baby without allowing the baby to get overheated. The bottom is a solid mattress rather than a soft space, which makes it slightly safer according to modern safe sleep standards. It's lightweight and it comes with a very reasonable price tag. Other cool features include a glowing, vibrating, and collapsible sides. Although this product is probably one of my favorites, it's only designed to be used until your baby is about three months old or until they can roll over on their own. It also doesn't have a lot of versatility. You can't transform it into a space for tummy time or a space for play. DockATot is great for co-sleeping. This portable crib/bassinet is made to fit into the bed right next to mom, while still giving your baby a little bit of their own space. The edges are lined with a pretty significant raised tube that is designed to provide a buffer between the baby and parent at bedtime. Some of DockATot's best features include the raised edges which cuddle the baby and recreate the feeling of being in the womb. This creates a comfortable setting and allows them to feel safe and secure. The tubes are made of hypoallergenic material that is air-permeable, meaning that it keeps the baby from getting overheated. The design of DockATot also makes it great for tummy time, traveling, or just hanging out. Specially made toys and covers can be used with the system to make it more fun and interactive for baby. DockATot is a little bit pricey. It runs about $175 on Amazon without any of the extra covers or toy attachments. There is also a risk of the baby getting caught up under blankets or pillows at night. Even though there is a buffer between the baby and the rest of the bed space, it isn't a foolproof system. If you do decide to use DockATot for co-sleeping, be sure to read and follow their safe sleep guidelines. 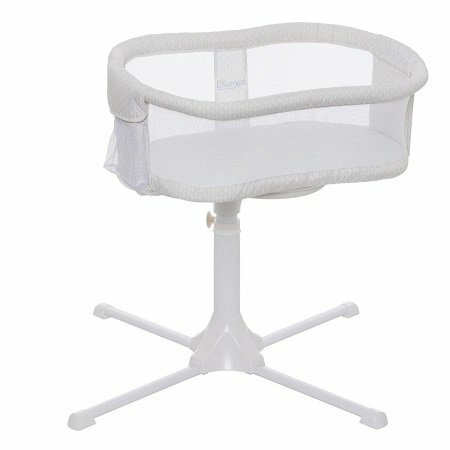 The Halo bassinet is made for room sharing. It has some great features that allows you to keep your baby very close all night long. This bassinet is top seller because it acts as a stand-alone sleeper and keeps the baby out of their parents’ bed. It is adjustable and swivels, allowing you to keep your baby at eye level, pull your baby closer, or swing them out so that you can get in and out of bed easily. The sides are also spring-loaded so they will lower with the weight of your arm. Upgraded models also come with storage stations, vibration settings, lullabies and sound soothers, nightlights, nursing times, storage caddies and mobiles. The Halo can get very expensive, especially if you want one with all of the bells and whistles. It's also not easily portable. It is lightweight but it requires quite a bit of effort and reassembly if you're going to travel with it. Arm’s Reach Concepts Clear-Vue is a more traditional form of the bassinet and is made to sit next to the bed. This sleeper is decidedly simple. The sleeper has a huge storage compartment that it perfect for keeping all of your extra diapers, wipes, sheets or whatever else you might need to make those nighttime feedings and diaper changes easier. Built with adjustable legs allowing you to bring your baby to eye level. All sides are made of mesh which gives you a view from any angle. It doesn't have lullabies, vibrations, or nightlights. The base also does not slide under the bed which means that you are not able to bring your baby as close as some of the other bassinets. The sides are not collapsible or spring loaded. Mothers who are recovering from a c-section may find it a little challenging to get to their little ones for the first couple of weeks in recovery. SwaddleMe By Your Bed is another option for room sharing. It's made specifically for the baby to sleep right next to the parent's bed without taking up any of their sleeping space. Like the Halo, this sleeper has adjustable heights and the legs which will slide under the bed so that the bassinet can be placed very close to mom or dad. The bed is adjustable and will incline to either 10 or 30 degrees to make sleeping easier for babies with acid reflux or congestion. 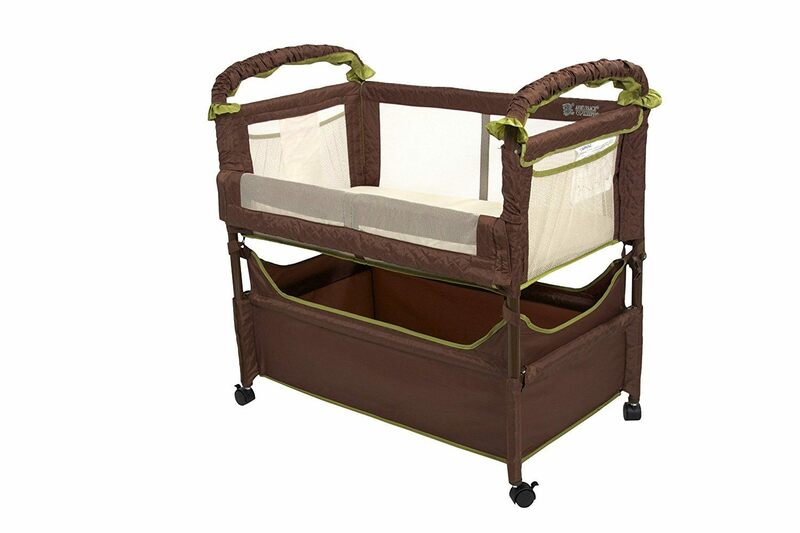 The bassinet also rocks back and forth, making it easy for parents to comfort their babies in the middle of the night. Like some of the other options, this sleeper comes with vibration setting, lullabies or sound soothers and nightlights. Some users have discussed design issues such as the lack of a removable liner and the lack of waterproof padding. These issues may make cleaning the sleeper a little more difficult since you can't machine wash them. It also doesn't lay flat, which can be a concern for some parents. Regardless of which kind of sleeping method you decide, your family will want the peace of mind that safe sleepers can provide. There are a ton of great options for co-sleeping and room sharing. It’s important that you take the time to do some research and decide what the best option is for your family.